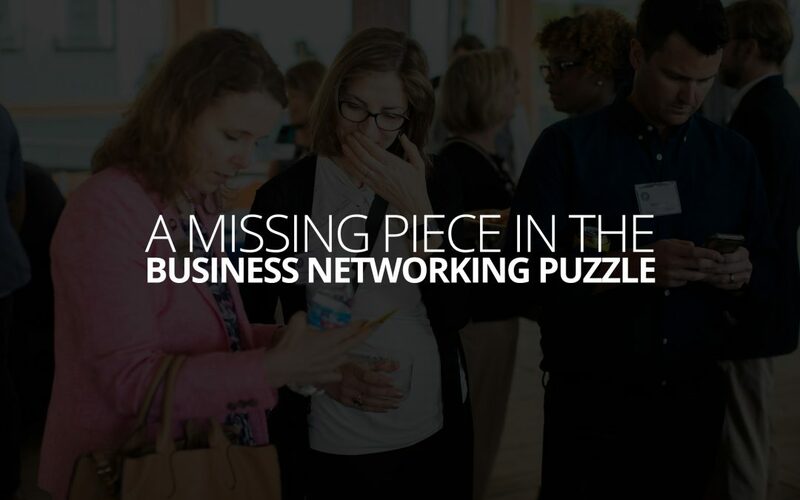 Like a lot of people, we drop off the business networking game quite a bit during the summer months, and I know we’re not alone. A lot of business owners and entrepreneurs see the busyness of their schedule uptick during this season. Their client’s kids are out of school, people are taking vacations, and most of us are spending a little more money. That’s a good thing, but it doesn’t leave a lot of spare time to go to your favorite networking event to meet new people or catch up with other professionals in your network. It’s been a crazy summer around here, and there’s still a little ways to go. But, before we all know it, we’ll be waking up on a chilly January morning and realize we’ve got to go make some new connections. So, I thought today (about 4 months out from your schedule clearing enough to get back in the networking game), I’d share an inspiring and motivating story about a past client, and now colleague, who made a surprising breakthrough by making one tiny change to what she was already doing. For the sake of anonymity, we’ll call her Alice. Alice finally put her headshot on her business card. This story starts about 6 years ago, when I first met Alice at a Laurel-based networking event. I’ll remark, the networking event wasn’t great. There were a lot of… lets just say ‘less than invested’ people there trying to make a sale—Networking events are not for making sales, but that’s a topic for another post. Regardless, while dodging pitches and incessantly checking my watch hoping 90 minutes had somehow already gone by, Alice and I found each other. We commiserated, gradually slunk away into our own corner—safe from the supplemental insurance and hand lotion flying overhead—and found ourselves in a lively exchange of ideas and stories. Alice, like most good entrepreneurs, has a lot of strong opinions, and a sense of purpose in her drive that both gives her the strength and determination to carry onward, as well as making it tough to absorb new and confounding ideas. Trust me, I know all about that. We were in good company together. In that first conversation, we talked about the challenges and the struggles of getting a business past those first few years in the marketplace, and we both had a good laugh about the stupid things we’ve tried in the pursuit of that elusive ‘traction’ people keep writing business books about. Then we swapped cards. Mine, at the time, was kind of tacky with too much texture and not enough information. But it did have a little picture of me on there. Her card was designed by her branding expert. It looked a lot nicer than mine. It was elegant, had all the right information, and it was clean. No erroneous design elements or details at all. But… no photo. Emphatically, I told her to get a photo on her card ASAP. As one might expect, she pushed back—probably rightfully so, too. After all, my card wasn’t, uh, great at the time. Her pushback came first because her company was an online company and it “didn’t really matter”. Then, because an expert had designed it and she trusted them. I said my piece and let it go, and we moved onto other chit-chat before the event ended and we parted ways for the evening. We exchanged a couple emails the next day, but then lost touch for a while. We ran into each other again about 5 months later at a different networking event. She walked right up to me and said, “William, we meet again!”. Scratching my head, I knew I’d met this person, but for the life of me I couldn’t place her. She caught me trying to put the pieces together and it was rather embarrassing, but we had a good little laugh about it. I teased her a little about the photo on the card, and we laughed. After catching up, we again parted ways. We met again another six months or so later and had almost an identical exchange. Of course, this time I remember much more quickly, and I beat her to the punch in teasing myself about it. The picture on her card became a running joke as we continued to run into each other as time went on. Then about a year ago, I heard that she’d finally decided to move out of state. I sent her a quick email to congratulate her on the move, and thats when she told me she felt like she was starting all over, and she was feeling frustrated. I just tried to listen and offer tidbits of advice here and there when she asked for them. Toward the end of our conversation (that lasted about 4 days, across dozens of emails), I returned to my advice about the picture on the business card. This time, only half joking, and half sincere. She carried our joke a little, but I sensed after everything she’d gone through, she was open to trying some new things. And finally, that brings us up to a phone call we shared a couple weekends ago. She wanted to call me to share some good news, and to officially end our long-running inside joke. Alice finally did put her headshot on her business card, and it was only the second networking event she carried them to that resulted in three coffee meet ups, an invite to a private networking group, and at least one new client. After more than a year networking in the same half a dozen groups, suddenly people were remembering, and what she does, and forming connections with her that seem to be opening doors. Now, look, I’m not going to pretend like Alice’s story here is entirely a result of some simple decision to put her face on her business card. Alice is this incredibly hard-working, driven person. She’s also just really nice and pleasant to talk to and easy to like, and after all these years she’s certainly distilled those qualities even further. Perhaps she finally stumbled into the right group, maybe she hit a critical mass of connections, maybe she changed her style, or honed her pitch, or got over her social anxiety. Who really knows? The point is, there’s a lot of reasons why her networking efforts may have started to pay off. But the suddenness of it, to me, suggests that the picture on her card played an important role. Social media may have changed the way our brains work. We are so accustomed to seeing a ‘profile picture’ and attaching it to a name and an experience, a classic business card in a modern world just kind of looks like junk mail; letters and numbers on a piece of paper you don’t really know what to do with. But a picture on a business card is something else. It doesn’t feel generic, even if besides that picture, it’s exactly like someone else’s card. It’s a picture of you, and you’re handing it to a person standing right in front of you, whose interested in engaging with you. Think about how that makes the identity connection in a person’s mind. Suddenly, it’s a little like they’re not just carrying your card with a picture on it, but a shortcut to the memory of their experience with you. Of course, we’ll never really know what happened for Alice, but I do know there’s a picture of her on her business card now, and I’m betting that it’s helping harden the connections she makes with people, and helping her live a little longer in their memory and that’s resulting in some movement. So, the moral of the story is, if you still don’t have a headshot on your business card, there’s nothing to lose and maybe, just maybe, an awful lot to gain. If you decide to do it, check out the Business Portraits pages here on our website, and let us know how we can help you!